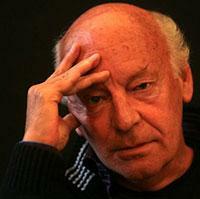 Eduardo Galeano, from Uruguay, was one of Latin America’s most distinguished writers. A recipient of many honors including the Lannan Prize for Cultural Freedom and the American Book Award, his groundbreaking books, Open Veins of Latin America and the Memory of Fire trilogy changed the way we look at Latin America with its rich and complex cultures, traditions and political currents. His book Children of the Days offers day book of poignant and poetic anecdotes from human history. He passed away at the age of 74 in April 2015.